A renowned Chicana poet, Emmy Pérez received her bachelor’s degree from the University of Southern California and her MFA from Columbia University. She has been a faculty member at the University of Texas – Rio Grande Valley since 2006. During that time, she has chaired thirteen thesis committees and led her students to present at countless academic conferences and venues nationwide, to receive significant nationally competitive fellowships and awards and to have their poetry and other work published in prestigious peer-reviewed literary journals and anthologies. Pérez’s poetry has been published in the Academy of American Poets Poem-a-Day series and appears on the Poetry Foundation online. 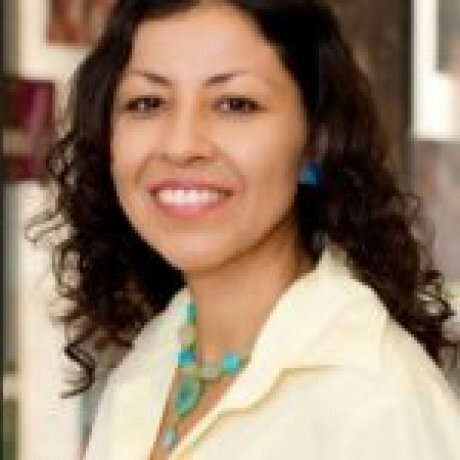 Her work has also been published in journals such as Prairie Schooner, North American Review, Indiana Review, Crab Orchard Review, Pilgrimage Magazine, PALABRA: A Magazine of Chicano & Latino Literary Art, and other publications, including the anthologies Orange County: A Literary Field Guide (Heyday), Entre Guadalupe y Malinche: Tejanas in Literature & Art (University of Texas Press), New Border Voices: An Anthology (Texas A&M Press), and The Wind Shifts: New Latino Poetry (University of Arizona Press). She has work forthcoming in the anthology Ghost Fishing: An Eco-Justice Poetry Anthology (University of Georgia Press). Her lyric essays have appeared in A Broken Thing: Poets on the Line (University of Iowa Press) and IMANIMAN: Poets Reflect on Transformative & Transgressive Borders in Gloria Anzaldúa’s Work (Aunt Lute Books). Together with Tato Laviera, Edna Ochoa and José Martinez she founded Cosecha Voices, a program that provides migrant farmworker youth the opportunity to document and share their testimonios www.utpa.edu/cosechavoices. In 2008, she founded an annual event on campus “El Retorno: El Valle Celebra Nuestra Gloria” that she coordinates with the Center for Mexican American Studies in honor of the late Gloria Anzaldúa. Over the years, she and her students, through service learning projects, have taught creative writing to youth and adults in three Edinburg, TX detention center facilities programs. In 2012, she received a University of Texas Regents’ Outstanding Teaching Award, and in 2016, a University Faculty Excellence Award for Student Mentoring. Pérez is the recipient of a 2017 National Endowment for the Arts fellowship in poetry. In previous years, she was a recipient of poetry fellowships from CantoMundo, the New York Foundation for the Arts, the Fine Arts Work Center in Provincetown, the MacDowell Colony, the Ucross Foundation, and the Atlantic Center for the Arts. She has also received the Alfredo Cisneros Del Moral Foundation Award for her poetry and the James D. Phelan Award for her prose writing. Since 2008, she has been a member of the Macondo Writers’ Workshop founded by Sandra Cisneros for socially engaged writers..
With the River on Our Face. Tuscon: University of Arizona Press, 2016. The Wind Shifts: New Latino Poetry. Tuscon: University of Arizona Press, 2007. “La Aurora,” “History of Silence,” “Swimming,” “Solstice,” “Ars Poetica,” “One Morning,” “Irrigation,” and “When Evening Becomes Stellar” in Just Outside the Frame: Poets from the Santa Fe Poetry Broadside (Tres Chicas Books, 2005). “Ghazal for Los Muertos” in North American Review, 2003. “Soft-Gelled Capsule” in New York Quarterly, 2002. “Bundling,” “Halliday Street,” & “The Room” in Borderlands: Texas Poetry Review,2002. “Self-Portrait on the Border,” “Upon Seeing Pecan Trees in the Outskirts of El Paso,” & “Without Whitewash” in Indiana Review, 2002. “After Revolution” & “I Am Looking” in Crab Orchard Review, 2001. “Made of the Same,” “Stray Animal,” “La Bufadora,” & “In the Draining Canal” in Prairie Schooner,2001. “From Here to Playa Luna” & “Bare Feet on the Streets” in Blue Mesa Review, 2001. “The Border” and “The Breathing” in LUNA: A Journal of Poetry and Translation, 1999. “Tumbleweed Rain” (fiction) in Story magazine, 1996.